Not to be too punny, but I’m running behind on this review…and I’ll explain later in this post. But, I didn’t want to miss out on the chance to say a few words about this issue. It gives us an RIP on an interesting character, and sets up a new status quo for the Rogues. Just who died, and what do I mean about the Rogues? Follow us after the jump to learn more! The person who died in Iron Heights was not Kristen. They certainly set up that possibility at the end of last issue, but the real victim here was a character created in the New 52 as a sort of replacement for the Top. Yes, it was Turbine who died here. We get a quick summary of his now-brief career, from his time as a Tuskegee Airman to his being stuck in the Speed Force for decades to being one of the Rogues. And now, he’s gone…and I’ll have some thoughts on that in a moment. …underneath Iron Heights itself! Yes, the Rogues are still in business, maybe stronger than ever as they can “hide in plain sight” in the middle of Iron Heights! Their underground headquarters allows them to control everything, while looking as if they couldn’t possibly be doing anything wrong. After all, they are in custody, right? Also in custody is August Heart, aka Godspeed. He promises Barry that he won’t tell his secret…but we all know how good his word is by now. Sure enough, he goes to the Rogues and offers them the Flash in exchange for freeing him from his power-dampening collar. And that’s where we leave it until next issue! Joshua Williamson gives us another brilliant plot, giving the Rogues a newfound level of threat that is impressive even for this group of bad guys. I’ve been a fan of the Rogues since they first appeared way back when i was just a kid, and seeing them portrayed this way just gives me chills (and no, I don’t just mean my favorite Rogue Captain Cold). Let’s talk a bit about the demise of Turbine. I was and am still a fan of Manapul and Buccellato’s work on The Flash in the early days of the New 52. But, this one character gave me mixed feelings early on. I was thrilled to see a character based on the legendary and heroic Tuskegee Airmen, but to see that character turn Rogue was a bit disheartening, even if it was played off as him being twisted by the Speed Force itself. That left me truly torn about the character, and I wish something different could have been done with him. The one (and possibly only) good thing here relates to why Turbine was created in the first place…as a replacement for one of the classic Rogues, the Top. I wasn’t happy to lose the Top from the lineup, and having this character gone does open up the literary door for the Top to someday soon become a full-fledged Rogue again. Still…I hate losing a character simply to clear the path for another character. You get that I’m torn here. What I’m not torn about is the way this plot is unfolding. We get a great view of what’s going on in Barry’s mind, the investigatory skills he has (even though he hasn’t caught on to the full threat yet). This is how a multi-issue storyline should develop, and I’m enjoying every panel. Speaking of panels (and art), the artwork is once again fantastic, thanks to Howard Porter (with colors by Hi-Fi). The four-legged member of my family is named Roxy, a Jack Russell mix we adopted from our local SPCA 10 years ago. She was attacked by another dog last week and had to go to the emergency vet for some work to recover from a puncture wound to her neck. Thankfully the wound was not deep enough to be life-threatening, but it took several hours to take care of everything and sew everything back together. She is recovering, and if things continue she should be fine in a few more days. But, that put everything else as secondary, and I hope you will understand. AS FOR THIS ISSUE: I’ll give this one a 9/10. A plot that is developing nicely with a great scrip and great artwork. Of course, that’s my opinion – what do YOU think? Leave your comments below! 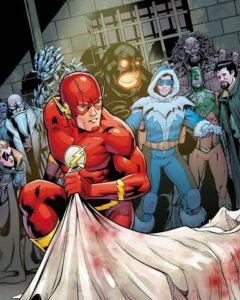 This entry was posted in Reviews and tagged Review, Rogues, the flash 36, Turbine on December 21, 2017 by Ed Garrett. Poor old Turbine. I’ve largely avoided commenting on that plot point because I never liked him for obvious reasons, but I do feel bad for anyone who did like him because I know what it feels like. I’ve never been thrilled with the way fans get pitted against each other by replacing one character with another, something we’ve also seen with the various Flashes over the years. It’d be nice if the characters could co-exist and we didn’t need to get rid of one to make room for another, but I guess that’s a bit of a pie in the sky ideal. Obviously I’m not going to lie though, I’d rather have Roscoe Dillon than Roscoe Hynes. So while I too have mixed feelings (I’d rather have seen him spin off into the sunset or do something different so there’s room for the Top to return), I’m overall satisfied with the situation.